When it comes to really enjoying a show at home nothing quite delivers like speakers that are mounted directly into your ceiling. 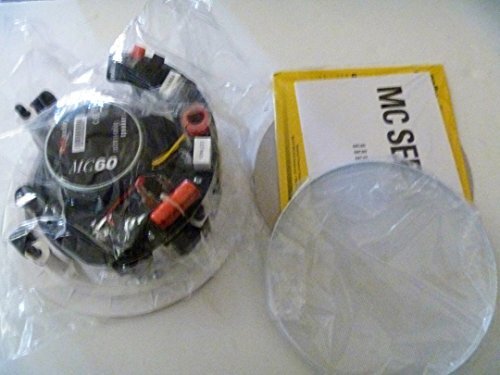 These type of in ceiling speakers avoid the hassle of having visible wires running throughout your room as well as deliver amazing sound for your enjoyment. Below we are going to list the top ten best ceiling speakers for achieving an amazing sound for your enjoyment. These speakers deliver an attractive design with a high quality product. 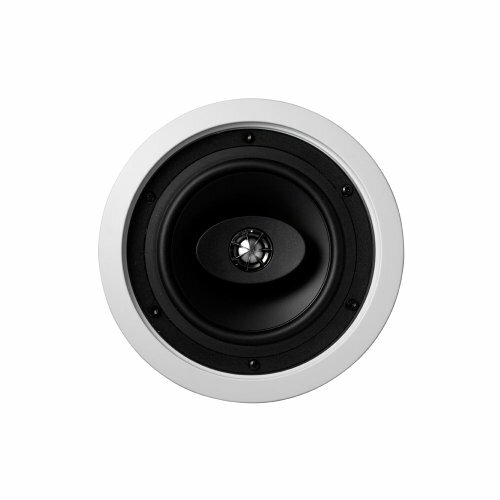 The in ceiling speakers themselves are white and have a compact design that is made to be flush with your ceiling. The white color scheme also helps these speakers to seamlessly blend into your ceiling so that they are hardly noticed. 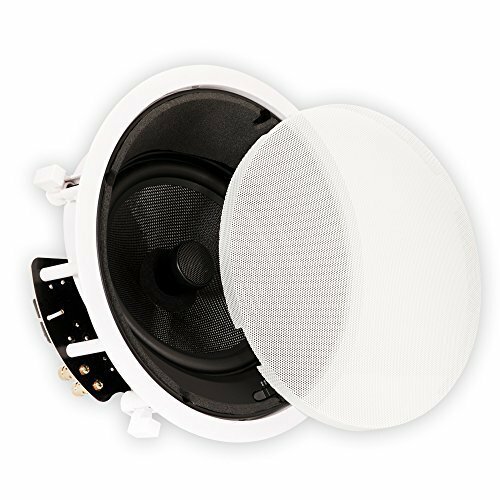 Each ceiling speaker features a nine inch diameter with a depth of 2 and 3/8 inch. These speakers also feature a directable one inch titanium dome tweeter with a whopping 250 Watts of peak power performance. 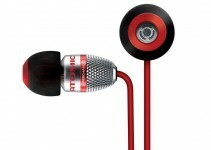 They also feature a one inch high temperature voice coil to deliver amazing sound quality. This best ceiling speakers set comes with four speakers for larger rooms. Having more ceiling speakers will give you the ability to create the immersive auditory experience you desire in larger rooms. These speakers are also very easy to install compared to some models. 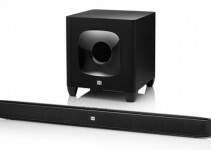 They feature 120 Watts of power with a frequency response range of 45 Hz to 24,000 Hz. 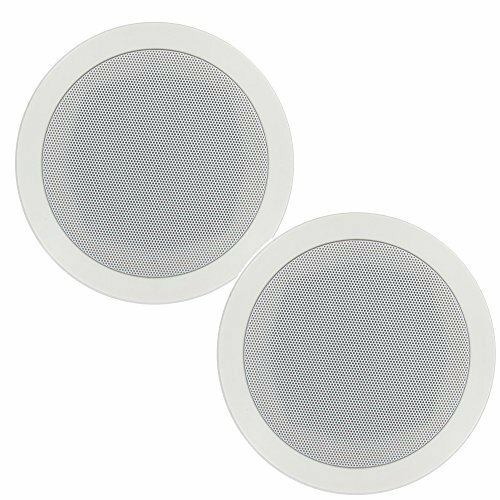 These ceiling speakers also feature a crossover frequency of 6,000 Hz and an 88 dB sensitivity range. In addition the speakers also feature eight inch PP Mica cone woofers to ensure you will have amazing sound quality. One last feature to mention about this set is the paintable aluminum grill with protective cover. This is a great quality especially for those that do not have the traditional eggshell paint color in their homes. 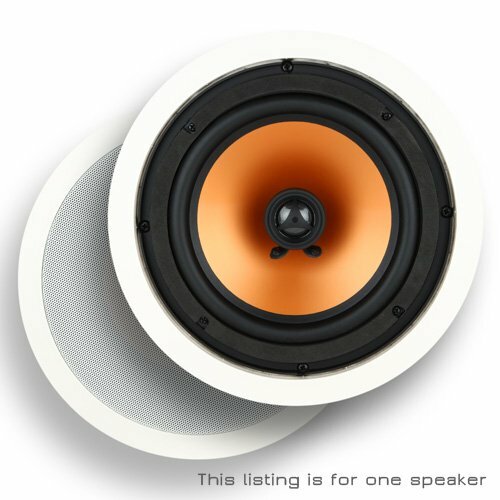 This enables you to match the color of your home to keep these ceiling speakers low profile. 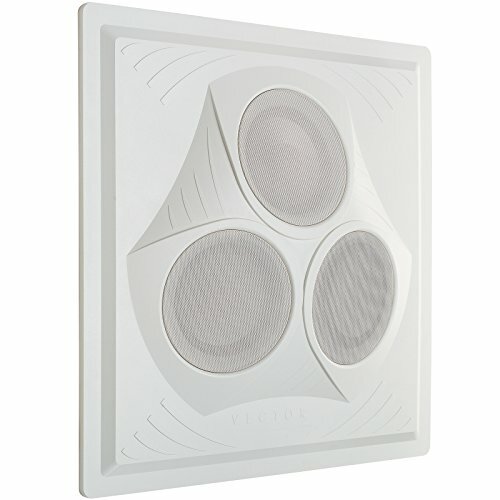 This best in ceiling speakers set from Micca features a deep vibrant sound with an amazing bass output. It is designed for optimal performance in a wide variety of home use applications. The ceiling speakers are very easy to install and are also able to be painted. This ensures you are able to match your existing room décor while adding to your auditory experience. The speakers are two way with a high excursion eight in poly woofer and a one inch soft dome tweeter. The tweeter and woofer are integrated over a 6 dB crossover network which helps to deliver crystal clear audio quality. The kind of audio quality you would expect from only the best ceiling speakers. Bose has been a leader in audio innovation for years and for good reason! It should come as no surprise then that they have a product featuring in our list of the best ceiling speakers. These speakers feature their signature enclosure technology which helps to deliver premium sound directed into the intended listening areas rather than your adjoining rooms. This helps to ensure that sound does not bleed over into unintended areas. The ceiling speakers feature rectangular and round grill frames and grills to enable you to customize the look of your speakers. The grills are also paintable which means no matter what these speakers will be able to blend in with your existing home décor. These Polk Audio ceiling speakers pack quite the punch! They feature a frequency response range of 60-20,000 Hz. 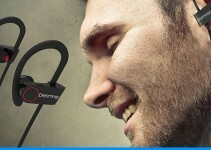 With this amazing range they are sure to deliver an amazing auditory experience. They also feature infinite Baffle tuning which will drastically improve your systems bass response. The speakers also have a 6.5 inch dynamic balance woofer with ¾ inch amiable silk dome tweeter. These features are sure to deliver a crisp yet powerful sound no matter what room you set them up in. 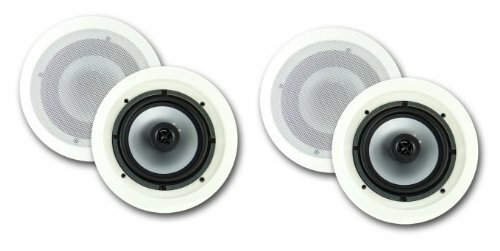 This set of the best in ceiling speakers feature a frequency response range of 46 Hz to 25k kHz with a 94 dB sensitivity. This impressive range means these speakers are able to deliver a plethora of sounds to you in crystal clear clarity. The speakers also feature a 5.25 inch woofer with aerated blue IMPP cone and rubber surround. In addition the speakers feature a three way design with PEI dome midrange and soft dome tweeter. All of these features packed together in these powerful ceiling speakers means that you will be blown away with their amazing sound. 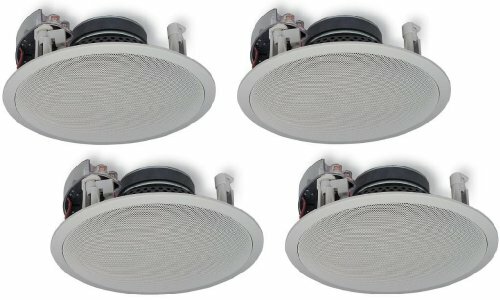 These ceiling speakers feature a unique recessed flush design with spring clip connectors. The speakers come with moisture resistant midrange woofer that has an INPP cone and surround sound system. This system will deliver an amazing bass sound thanks to this setup. The speakers also feature an 8 Ohm impedance rating and a frequency response range of 75 Hz to 20 kHz with a 91dB sensitivity. These speakers deliver crystal clear sound over a wide sound range to ensure you get the most out of your home entertainment package. This unique setup is actually a ceiling speaker array. You are able to achieve similar results with this one array speaker as you would with three individual speakers. These speakers are quite powerful coming in at 120 Watts at 8 Ohms. The speaker has three 6.5 inch full range drivers which deliver an amazing amount of volume while not sacrificing audio quality. If your home entertainment area features standard ceiling tiles this speaker array is able to fit directly into the opening as is. Also the ABS housing is fire retardant and may be painted any color to match your home décor. 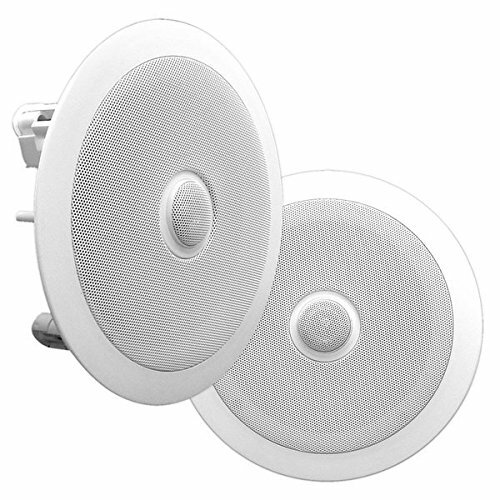 These ceiling speakers feature a mounting leg that is extremely easy to use that distribute the force of the speaker evenly. This allows for easy installation without damaging your wall or ceiling. The speakers also feature an asymmetrical tweeter island driver design. This setup allows these speakers to deliver exceptional audio quality without distortion. Another feature of these speakers is the tangerine waveguide. This waveguide has very wide dispersion characteristics while providing amazing driver protection. You are sure to be amazed with the sound quality and ease of installation with this set of the best ceiling speakers. These speakers feature an eight inch interlaced glass fiber driver with a butyl rubber surround that is built for longevity. These powerful speakers feature a 200 Watt RMS with a 400 Watt max. The speakers also boast an impressive auditory range of 25 Hz to 21,000 Hz with a 97 dB efficiency. The sheer amount of power these speakers boast is quite impressive while being packaged in an attractive design. Having a good speaker setup is crucial to creating a perfect home entertainment atmosphere. With the best ceiling speakers set up, you are able to create an immersive auditory environment without all the fuss of dangling wires that traditional speakers are plagued with. Your friends and family will be envious of your entertainment setup once you have installed one of these awesome speaker systems in your home!